Two sweaters link arms in Hardeep Pandhal’s Parent Culture. They are conjoined by slack, interlacing red threads. Is this a thorny embrace, or a tender one? 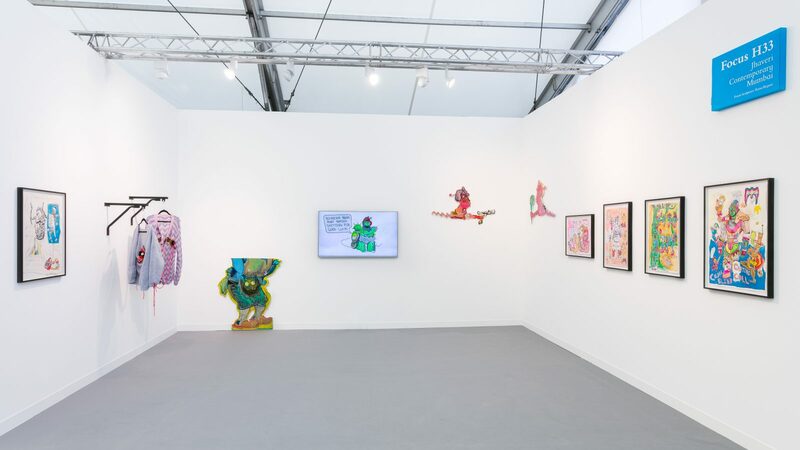 The Glasgow-based, Birmingham-born artist, showcased Parent Culture with Jhaveri Contemporary at Frieze London in September. Although this was his first ever art fair, his relationship with the gallery began in 2014, when he took part in the Asia Triennial Manchester. Parent Culture was one of eight new works by Pandhal on display at Frieze, exhibited together under the title Decolonial Dungeon Mastery. Typically for the artist, the mixture of drawing, moving image and knitted sculpture set out to explore issues of postcolonial resistance and trauma. As the eponymous “dungeon master”, Pandhal’s handling of his subject matter was playful and bleakly funny, drawing inspiration from video games and science fiction. The garment-objects of Parent Culture have a long history in the artist’s practice. For several years, Pandhal has been co-producing knitted works with his mother, who knits the textiles that the artist then embroiders, stitches and sculpts. The catch? Pandhal’s mother speaks as little English as her son speaks Punjabi. What is lost in translation is articulated in the puckering of fabric, the loose threads, and the strained conversations between the artist’s hand and his mother’s. At the same time, the work is strangely seamless. Despite the language-barriers of its production, it achieves a unique and non-verbal mode of expression. The term ‘parent culture’ is taken from sociology, where it is defined as “any identifiable culture that may influence another.” Ironically, in contemporary Britain, Pandhal’s literal ‘parent culture’ — the culture of his mother — is subcultural. Through clever wordplay, the artist unravels the term’s knotty contradictions, probing at parenthood as a metaphor for cultural identity: what happens when your ‘mother tongue’ isn’t your mother’s? And what if your ‘parent culture’ is different to your parents’? As an emerging artist, Pandhal has been lauded for his whimsy and experimental energy. But, has he earned his mother’s approval? The artist describes a sense of “cultural dislocation from his first-generation British Sikh parents” as the primary focus of the piece. The strained relationship between the two garments reflects this inherent tension. Pandhal also says that Parent Culture has been “personally uplifting”. Even while it opens up questions of loss and alienation, the collaborative process of the artwork attempts to bridge the gap between mother and son. Rather than rejecting his ‘parent culture’, the artist modifies it, borrowing motifs from video games to give the work a visual vibrancy and adolescent sense of play. Knitting as a medium adds a further dimension to the artwork. As well as conveying the stringing together of identities, ideas and cultures, it borrows from notions of the ‘subcultural’ in art. 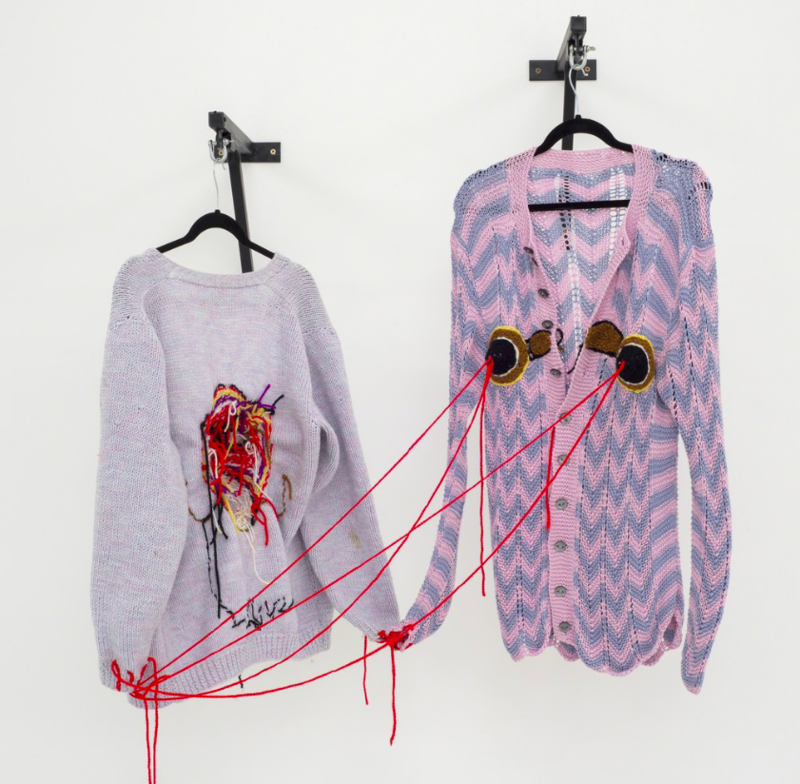 Like the reclamation of heritage craft traditions, or the redefinition of ‘women’s work’ by female artists, knitting allows Pandhal to express a sense of being an outsider in a majority-white British art scene. Hardeep Pandhal was born in Birmingham in 1985 and currently lives and works in Glasgow, Scotland.